Feroze Gandhi is a Parsi (not a Muslim as some claim), a politician and a journalist who served as the publisher of the National Herald and the Navjivan newspapers from Lucknow. His father was not any Khan, but Faredoon Jehangir from Bombay. In 1930, Feroze met Kamala Nehru and Indira among the women demonstrators picketing outside Ewing Christian College, Allahabad. Kamala fainted with the heat of the sun and Feroze went to comfort her. The next day, he abandoned his studies to join the Indian independence movement. He was imprisoned in the same year, along with Lal Bahadur Shastri and lodged in Faizabad Jail for nineteen months. Feroze first proposed to Indira in 1933, but she and her mother rejected it, saying that she was too young, only 16. He grew close to the Nehru family, especially to Indira’s mother Kamala Nehru, helping arrange her trip to Europe when her condition worsened in April 1935, and visiting her at the TB sanitarium in Europe, where he was at her bedside when she died. Kamala Nehru was so impressed by the conduct of Feroze that on her death-bed, she insisted on Indira marrying Feroze. In the following years, Indira and Feroze grew closer to each other and they married in March 1942 according to Hindu rituals. The saree that Indira wore for the marriage was a khadi sari that Nehru wove and is pink, not red. It was worn by Indira on her wedding day, then by Sonia on her wedding day in 1968, and then by Priyanka too when she got married in 1996. Red is generally the bridal colour in India and the Gandhis to choose the more low- key pink and leave the fiery red, a symbol of simplicity and tradition. 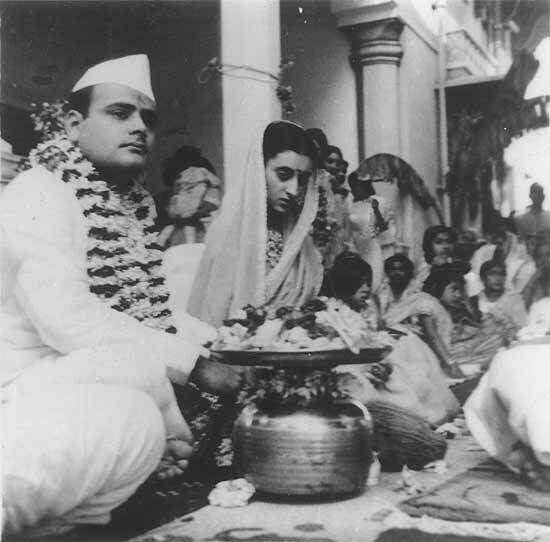 Feroze Gandhi won independent India’s first general elections in 1952, from Rae Bareli constituency in Uttar Pradesh. Indira came down from Delhi and worked as his campaign organizer. Feroze soon became a prominent force in his own right, criticizing the government of his father-in-law and beginning a fight against corruption. In 1957, he was re-elected from Rae Bareli. In the parliament in 1958, he raised the Haridas Mundhra scandal involving the government controlled LIC insurance company. This was a huge embarrassment to the clean image of Nehru’s government and eventually led to the resignation of the Finance Minister TT Krishnamachari. This story was narrated to me by Ms Bimla Behn, who used to be the hostess of Teen-Murthy Bhawan when Nehru was the PM. Further I had spoken to Mr Sharma, the caretaker of Teen-Murthi Bhawan from Nehru’s days. Our unit was responsible for VVIP security when Mrs Gandhi’s body was lying in state in Teen-Murthy Bhawan for viewing, during the first week of November 1984, after her assassination on 31 October and there I met Bimla Behn and Sharma. They further spoke to me in detail about the relationship between Nehru, Feroze and Indira and the role played by MO Mathai who was Nehru’s secretary. The rise of Mathai (a typical Syrian Christian like me, from the Central Travancore) from being a helper to the cook of Teen-Murthy Bhawan to be the PM’s secretary is another volume. The aspect that Feroze and Indira lived separately after the birth of Sanjay is somewhat correct as by that time Mathai had succeeded in driving a wedge between Nehru and Feroze. Feroze was part of the fiery young Turks with Chandrasekhar (later PM) and Mohan Dharia and they opposed a lot of Nehru’s policies in the Parliament and party forums. So Feroze avoided any contact with Nehru, but used to enter the Teen-Murthy Bhawan from the Right Flank and go upstairs where Indira lived. This was narrated by Bimla Behn. Bimla Behn further said that after the death of Nehru, Indira was appointed the communication minster in the Shastri’s cabinet. In those days she always suffered from common cold and a runny nose. If you observe the photographs of those years, one can always see Indira clutching a kerchief in her hand. That was when Indira came in contact with Dhirendra Brahmachari who advised yoga as a cure for her runny nose. She practiced yoga regularly and was rid of the problem. Regarding the death of Sanjay, I had interacted with the President of the Delhi Flying Club in 1984 – (he was related to one of our unit officer). The aircraft was imported as CKD (Complete Knock-Down) kit and it came in boxes. A week before the fateful day, Sanjay ordered the President of the Flying Club to get the plane assembled. After assembly, even though it was not test-flown and certified by DGCA, Sanjay insisted on flying it. Some mal-function resulted in the accident and Sanjay Gandhi died instantly from head wounds from the air crash on 23 June 1980 near Safdarjung Airport. So please do not get carried away by any propaganda taking rounds in the social media. I have searched the web and have not found any information which says that M O Mathai was helper to a cook in Teen Murthi Bhavan. The only information that I could find was that he had done his degree from Madras University and was working in a tea estate in Assam and then joined Pt Nehru in 1945. The story is that MO Mathai gained entry to the Nehru household when he joined as an assistant to the cook at the Teen Murthy Bhawan and then he ensured that he was seen by Nehru. He used to do all chores for him, serving him bed-tea, breakfast, polish his shoes, prepare his dress, etc. Nehru realised that Mathai was well educated and could also handle his files, take down notes, type a letter, etc and slowly he worked his way up to become Nehru’s Personal Secretary. This was narrated to me by Mr Nekh Raj Sharma, who was the caretaker at Teen Murthy Bhawan in 1984 and had been working there since Nehru days. Hence the information that MO Mathai was with Nehru from 1945 seems a bit inaccurate or else Mr Sharma is inaccurate as Nehru moved into Teen Murthy Bhawan in 1950 on becoming the Prime Minister. During the British Raj, Teen Murthy Bhawan was the official residence of the Chief of the Army Staff, the number two in the hierarchy following the Governor General. Long ago I had served in Rae Bareli. I have visited the family haveli of Firoze Gandhi. They follow islam as a religion.